Introduction: Magical Melody is the first big-console game to allow for players to select their gender at the beginning of the game. Previous to MM the only other games that did so were the second and third Gameboy color titles. The story of the game is about the Harvest Goddess, who has sealed herself away because she believes nobody has love. Your character enters the scene because of a newspaper advertisement sent by Mayor Theodore, glorifying Flower Bud Village as a great place to start a farm. Once you discover the stone-form Goddess you are asked to find 101 Musical Notes that will become a melody to free her. Magical Melody brings back characters from the Super Nintendo and Save The Homeland games, as well as a few new people. Each gender has up to 10 possible marriage candidates, plus the ambiguous-gender character Jamie, who will be the opposite gender of the character you play as. 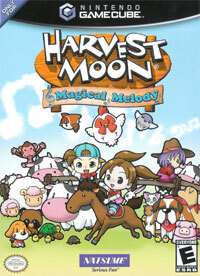 This game is based on the second incarnation of the game, called Songs Of Happiness For World in Japan. The regular version of SoH was not released in English, but the For World version includes Jamie as a potential spouse, new emotion voices, much needed bug fixes, and a cheaper price. The game also increased in difficulty, as many items you could ship had their profits cut in half. The Gamecube version of the game was not released in Europe. Instead, Rising Star Games opted to convert it to a Wii game, changing the controls to support the wii remote and removing the girl-gender playable character. Other than that, the European Wii version plays the same as the North American Gamecube version.